✌ ARE YOU FED UP OF SLIDING RUGS OR RUG CORNERS INTERFERE WHEN YOU WALKING??? FORGET IT! 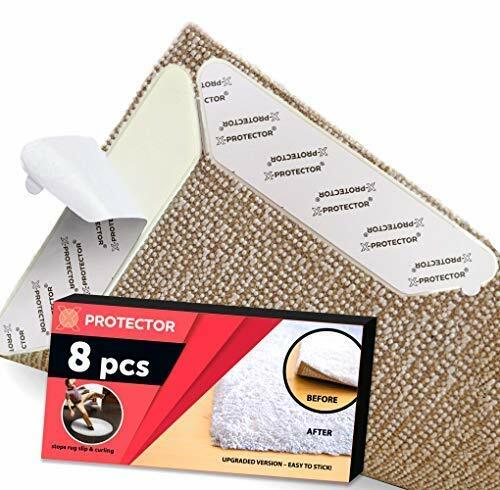 Stays Your Rugs in Place & Make Flat Corners with Premium Rug Grippers X-PROTECTOR® - Best Rug Holders! ✌ X-PROTECTOR® CARPET GRIPPERS is 1/8 INCH thick only and work perfect INDOORS AND OUTDOORS (for outdoors work only as anti-curling rug pads). It's SAFETY & EFFECTIVE FOR ANY HARD FLOOR - Hardwood, Linoleum, etc, much better than double sided rug tape for carpet! 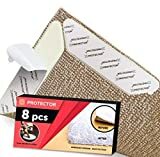 ✌ X-PROTECTOR® rug grips will work for ANY TYPE & SHAPE of Your rugs - STOPS SLIDING Your rug & keep it in place; also it will MAKE CORNERS FLAT AT ONCE AND FOREVER! ✌ X-PROTECTOR® anti-curling grippers have PREMIUM QUALITY and they are reusable because of RENEWABLE STICKY SURFACE - better than removable carpet tape. IT'S MADE TO SERVE YOU AGAIN & AGAIN. ✌ X-PROTECTOR® IS A REGISTERED TRADEMARK - AVOID CHEAP COPIES AND FAKES. X-PROTECTOR® IS A CREATOR OF THIS PRODUCT and WE GUARANTEE ONLY OUR CUSTOMERS PREMIUM QUALITY AND 100% SATISFACTION WITH PRODUCT. IF YOU DON'T LIKE CARPET GRIPS - WE WILL REFUND YOUR MONEY. ORDER IT NOW RISK FREE - PRESS THE BUTTON «ADD TO CART» Right Now! Although we try our best to provide reliable information, due to the many applications of our products, we recommend performing suitability tests for our particular application. Do not solely use this information to determine the usability of these products for your application. No person is authorized (including our company) to assume any liability or obligation for the suitability of this product for a particular application. Liability may not exceed the cost of this product.